Yuletide is a Norse name for the Winter Solstice, referring to the year's cycle as a turning wheel. Ostara is another Germanic name, deriving from the same root as the word east and cognate with the English Easter, originally a pagan spring holiday. It's also related to a Latin word for egg, which figured in folk rites then as now, and shows up in medical language referring to ovulation, as in the oestrus cycle. 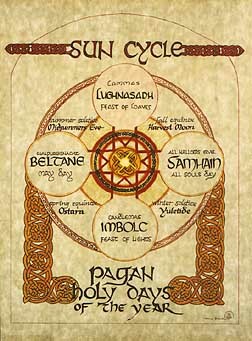 The cross-quarter holydays of the old Celtic calendar fall between the solstices and equinoxes. Samhain is a Pagan New Year, a time when spirit hosts are abroad, marking the onset of darkness and winter. Imbolc is named for ewe's milk, the time of calving when light increases and serpents emerge from the hills. Beltane begins with bonfires on May Eve, and is celebrated with garlands, music, dancing, maypoles and fairs. At Lughnasadh (also called Lammas, originally loaf-mass) women bake loaves of the first-harvested grain and people gather at lakes and hills.